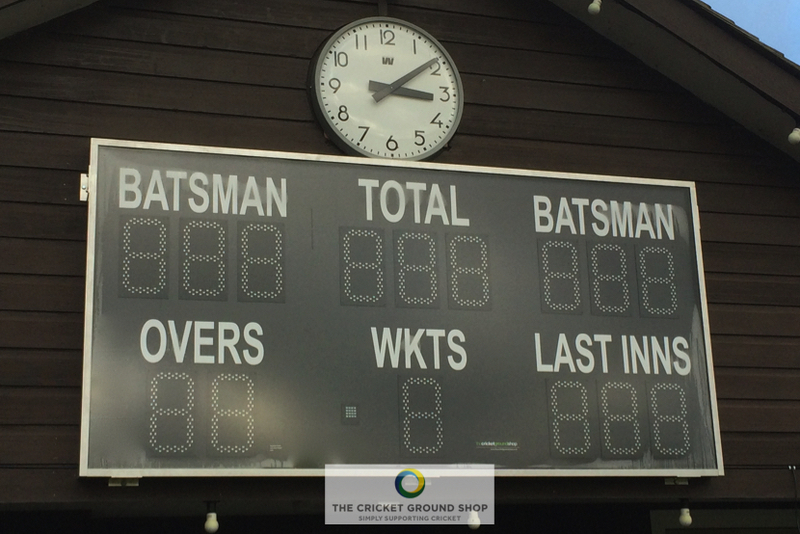 All our scoreboards are hand built in the UK and are made bespoke. We can even mix digit sizes for improved layout and readability. All boards can be permanently fixed between posts, on a fascia / wall or temporarily hung or trolley mounted (optional extra) for secure storage after game time. 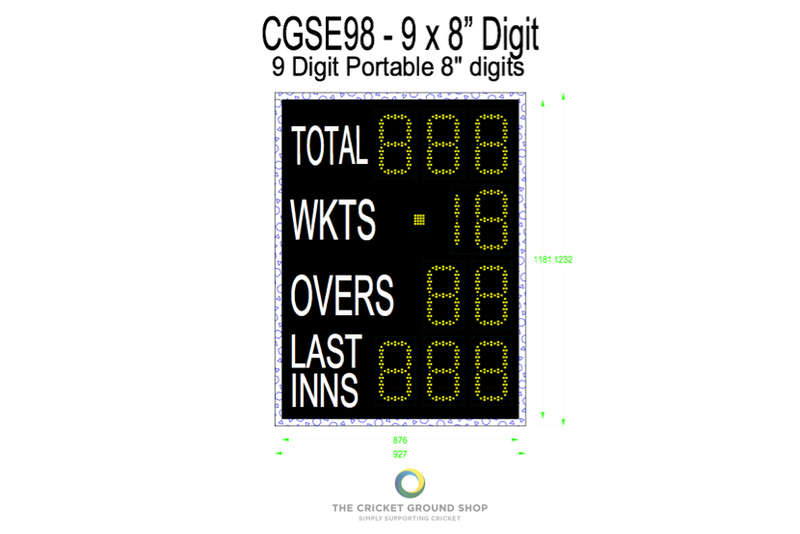 CGSE98 Electronic Scoreboard is a great entry level club scoreboard. In a ‘Portrait’ layout with 9 x 8″ digits. Incorporates Total, Wickets, Overs and Last Innings.Size – 915 x 1220 x 100mm approx. 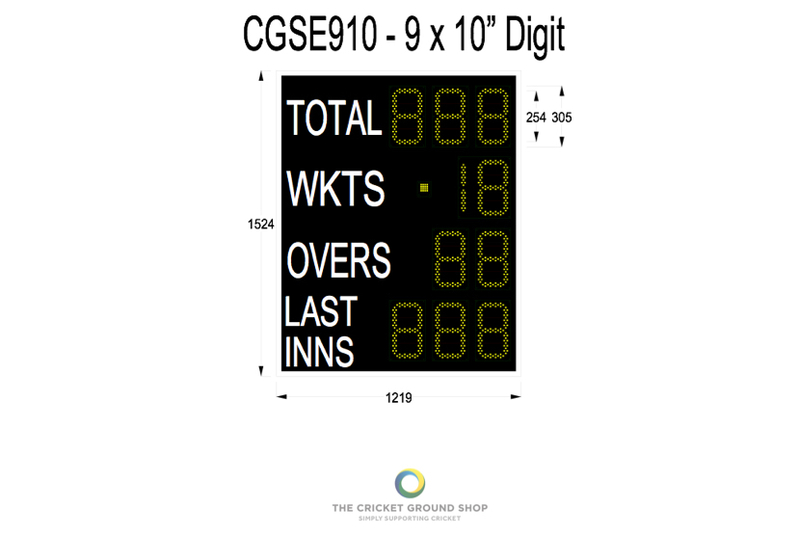 CGSE910 Electronic Scoreboard is in a ‘Portrait’ layout but with nine larger 10″ digits on an overall larger board. Incorporates Total, Wickets, Overs and Last Innings.Size -1220 x 1525 x 100mm approx. 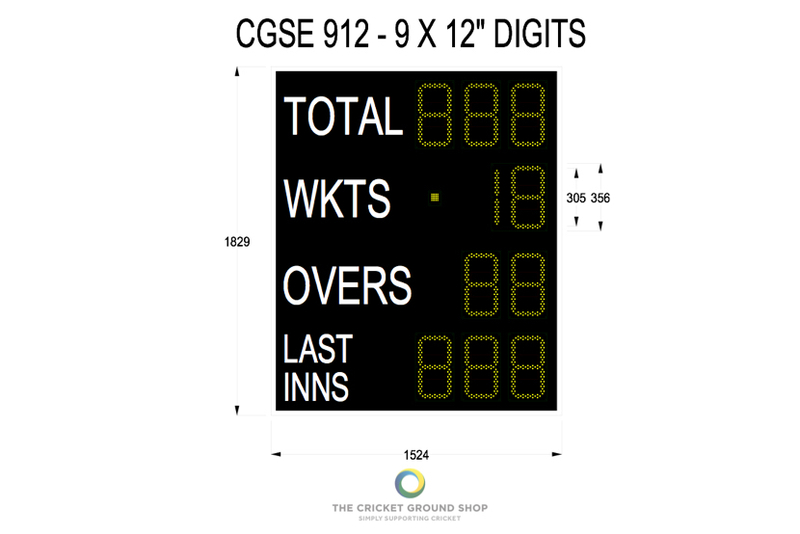 CGSE912 Electronic Scoreboard is our largest ‘Portrait’ layout but with nine larger 12″ digits on an overall larger board. Incorporates Total, Wickets, Overs and Last Innings.Size – 1525 x 1830 x 100mm approx. 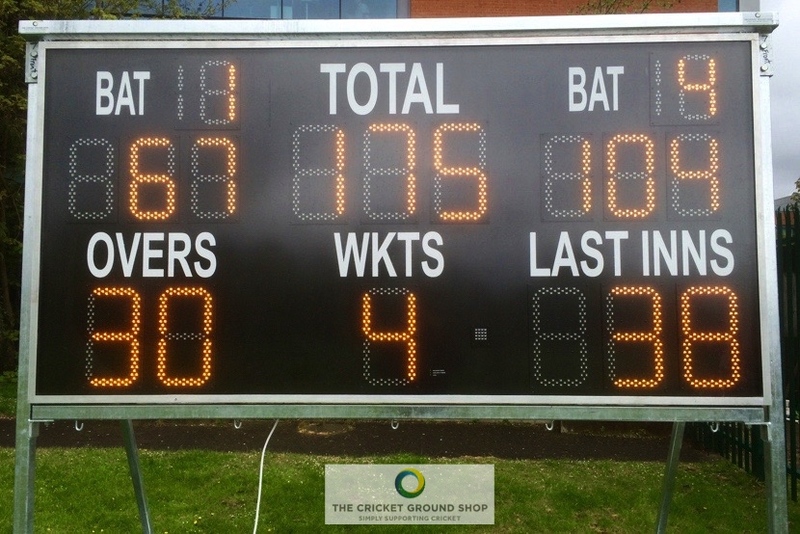 CGSE1510 Electronic Scoreboard is our popular landscape layout with fifteen 10″ digits. 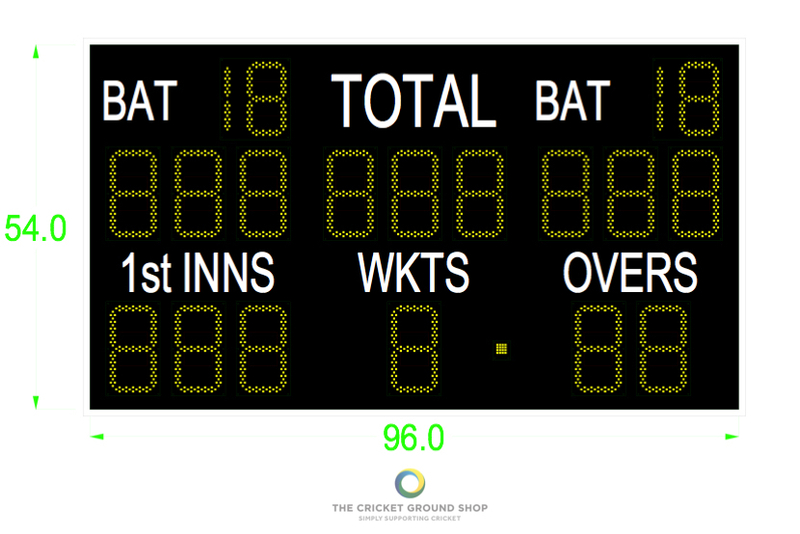 Incorporates Total, 2 x Batsman Scores, Wickets, Overs and Last Innings.Size – 2440 x 1220 x 100mm approx. 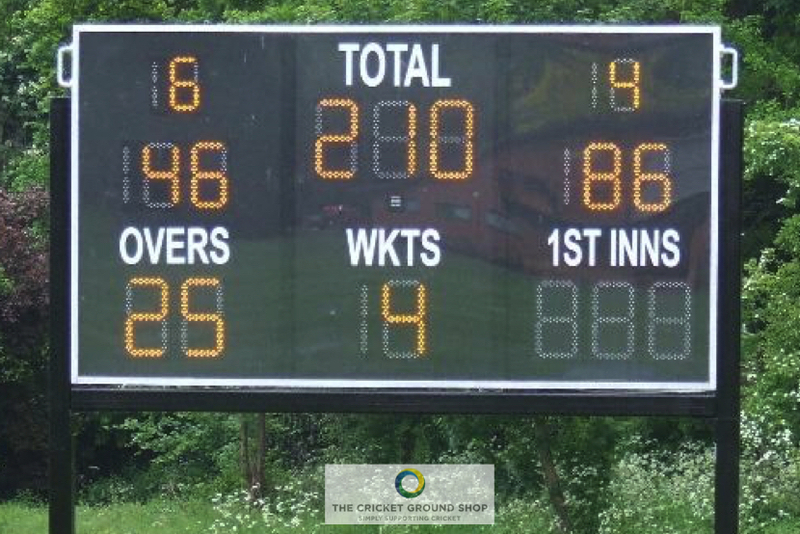 CGSE1512 Electronic Scoreboard is our large landscape layout with fifteen larger 12″ digits. Incorporates Total, 2 x Batsman Scores, Wickets, Overs and Last Innings.Size – 2441 x 1220 x 100mm approx. CGSE19 (v.4 Design) is our popular, larger landscape layout using 19 mixed size digits for improved readability. IncorporatesTotal, 2 x Batsman Numbers & Scores, Wickets, Overs and Last Innings.Size – 2438 x 1219 x 100mm approx. 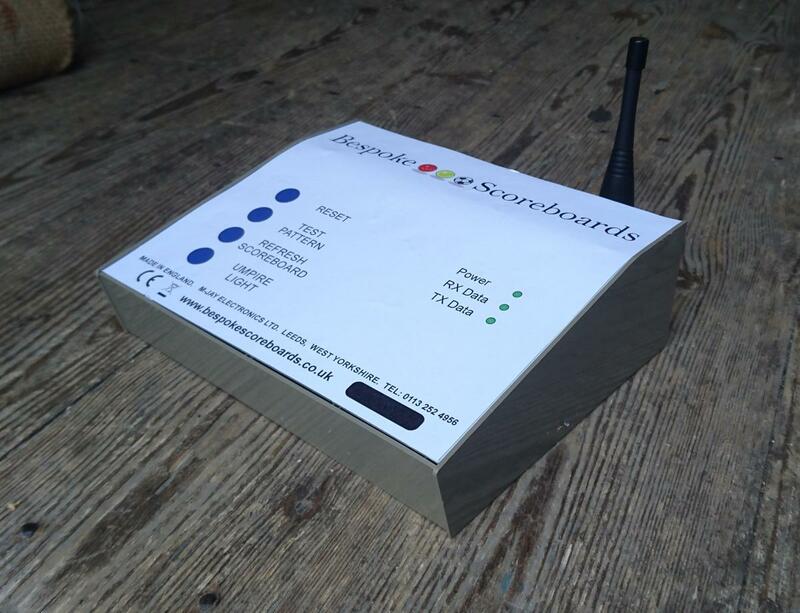 Designed for laptops and personal computers (with Windows) running the new ECB Play Cricket Scorer Pro software to communicate with all Bespoke Scoreboards. As yet untested on iPads and Macbooks. Complete with wired controller. Wireless upgrade available. Highly visible digits, legible from 120 degrees. Mains or Battery powered- Capable of powering board for 2 full matches. Polycarbonate- 6mm Makrolon non reflective polycarbonate. No ‘hidden’ costs- Power pack/ battery / cables / wired controller all supplied. Umpires indicator light also comes as standard. Warranty / After Sales- our manufacturer is UK based, so offer a dedicated UK after sales technical helpline. 12 Month parts and labour warranty. Boards can incorporate mixed digit sizes for improved layout and readability.